Continued innovation drives the need for better ICT flexibility as new and more intensive uses are found for computational processing. With increasingly large amounts of data being generated and requiring processing, IT capabilities must be able to scale easily to match the ever-growing demands. Cheaper and better technology is creating a more connected world: 8 billion devices are now connected to the internet; by 2030, that number is forecast to grow to 1 trillion. As the cost of advanced technologies continues to fall, new applications will be opened for them, as well as opportunities to combine them in innovative ways. This unleashes "combinatorial" effects, where the capability of technologies working in tandem far exceed their capabilities when deployed separately. 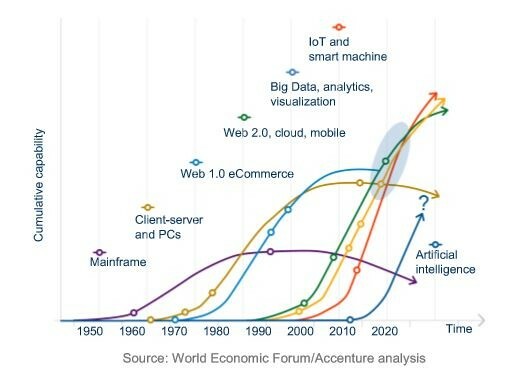 The combinatorial effects of base technologies, such as mobile, cloud, sensors, analytics and the Internet of Things (IoT), are accelerating progress exponentially in data generation.